Chef Ricardo Zarate presenting his baby back ribs. Tomorrow Chef Ricardo Zarate’s new fall menu debuts at his West L.A. Picca Restaurant. I scored a sneaky peek and taste of the 20 dishes this week at a media dinner, which was kinda eery considering just the week before I said that a 15-course dinner paired with cocktails was my idea of the perfect last meal on earth. Fortunately the world didn’t end and I got to surpass my goal by five more dishes. For the new menu Zarate brought back his favorite dish, one that he’s very proud of, the Anticucho Lengua. 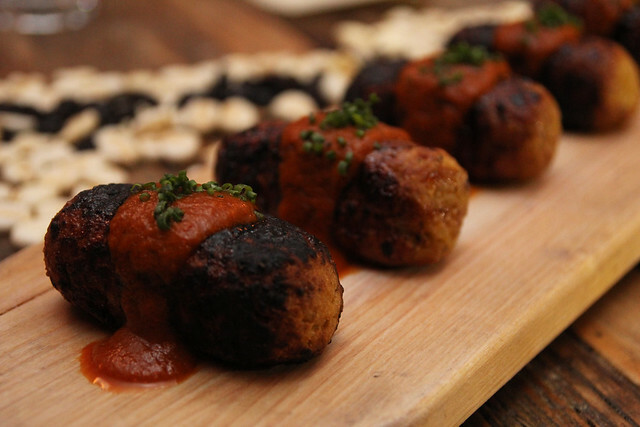 “It’s very soft but crispy because of the robata grill,” he said, adding that the best part of the dish is the tomato skin chips garnish. He had originally debuted this dish when Picca first opened last year but has “upgraded” it for this menu by tweaking the sauce. Here were a few of my favorite dishes from the dinner. Offal fans (not me) will be happy to hear that there’s also a gizzard dish (Anticucho Mollejita, which is another chef favorite) and a chicken liver teriyaki (Anticucho Higado). 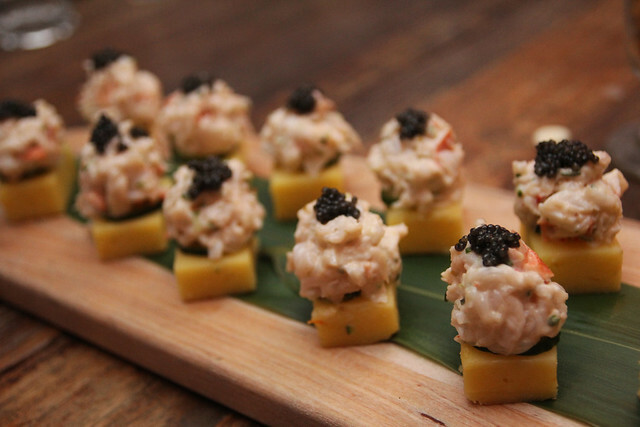 Causa Lobster was one decadent bite with caviar atop the lobster mixture of cucumber yuzu mayonnaise and shallots. 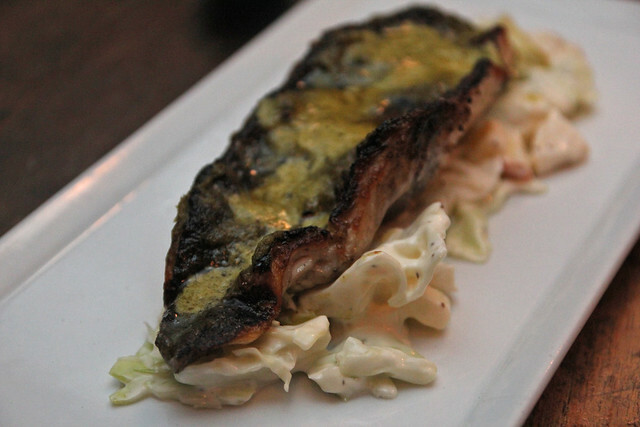 Anticucho Pescado is branzino filet grilled on a robata grill and topped with huacatay (Peruvian black mint) butter. The skin here was crisp and perfectly salted. 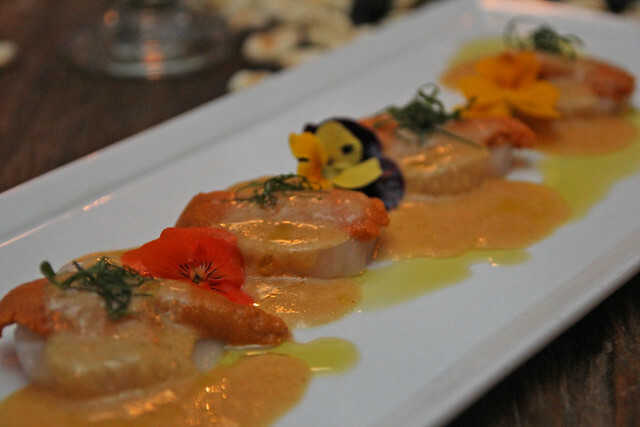 Uni scallop tiradito with diver scallop, sea urchin leche de tigre and oba leaf is heavenly, melting in your mouth. 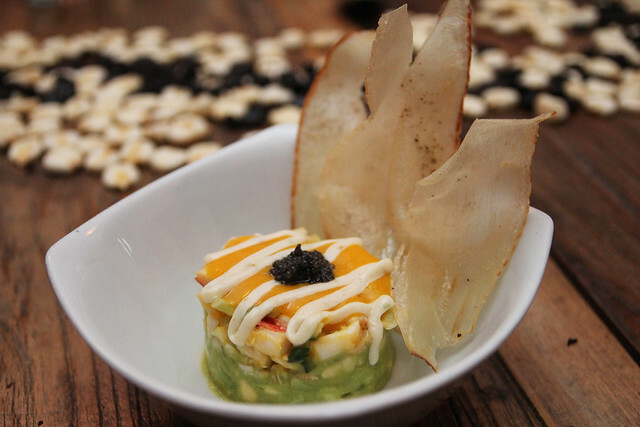 Lobster tartare with mango leche de tigre, ginger, yuzu mayonnaise and yuca chips was a fun dish but it needs more chips! Ended up spooning the excess bites into my mouth. No need letting that go to waste. 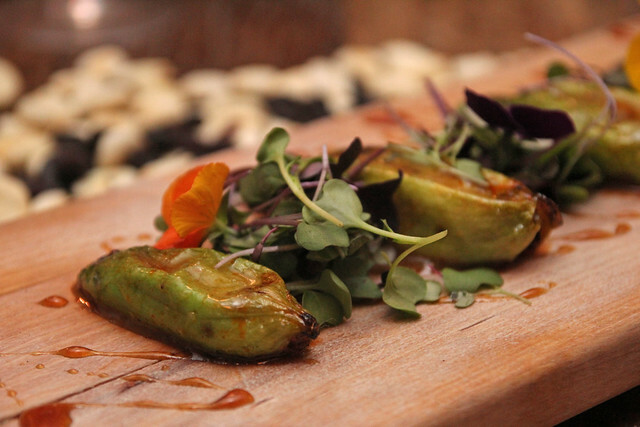 Caigua dish with Peruvian cucumber stuffed with slow-cooked beef, raisins and feta and drizzled with sweet lime miso. The vegetable here is more chili in texture than cucumber. Tacu Tacu Onigiri made with short grain rice, garbanzo beans, rocoto-chancaca BBQ looks like a sausage but is a savory vegetarian alternative. 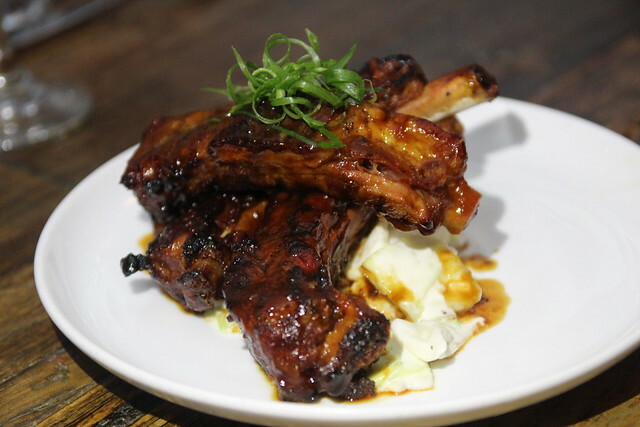 Costillitas baby back ribs with rocoto-chancaca and coleslaw rustico has meat that just falls away from the bone. Langosta Maine half lobster, aji amarillo bechamel and herb planko. 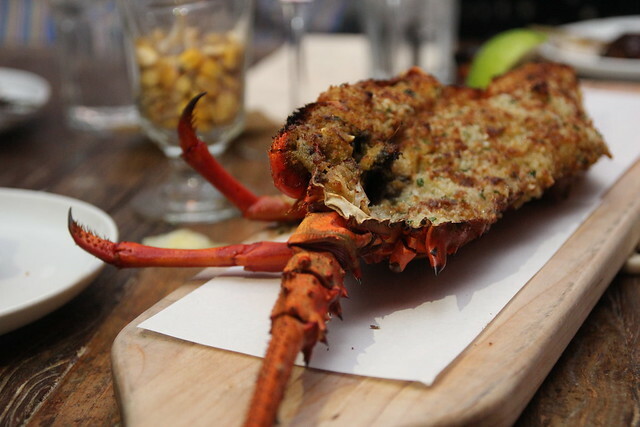 By the time this lobster showed up at the table, we were all stuffed but I managed to rally and enjoy a bite. Wanted to know what a $65 lobster tasted like. Pretty damn good. This looks like a great meal. 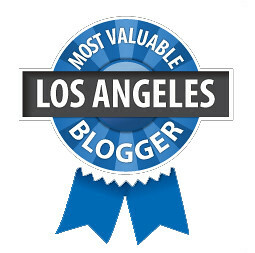 Bummed I missed it. The caygua dish looks like a really fun play on a chile relleno. And you’re lucky to have tried so many different lobster preparations. That Caygua dish was tasty. Apparently it’s perfect for breakfast.